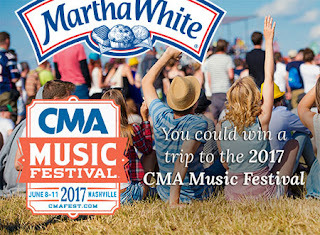 Win a Trip to CMA Fest 2017 from Martha White Baking! Win a trip for two to the 2017 CMA Music Festival from Martha White Baking! Grand prize winners will receive a trip for two including airfare, 5 nights lodging, and lower level tickets to the 2017 CMA Music Festival!